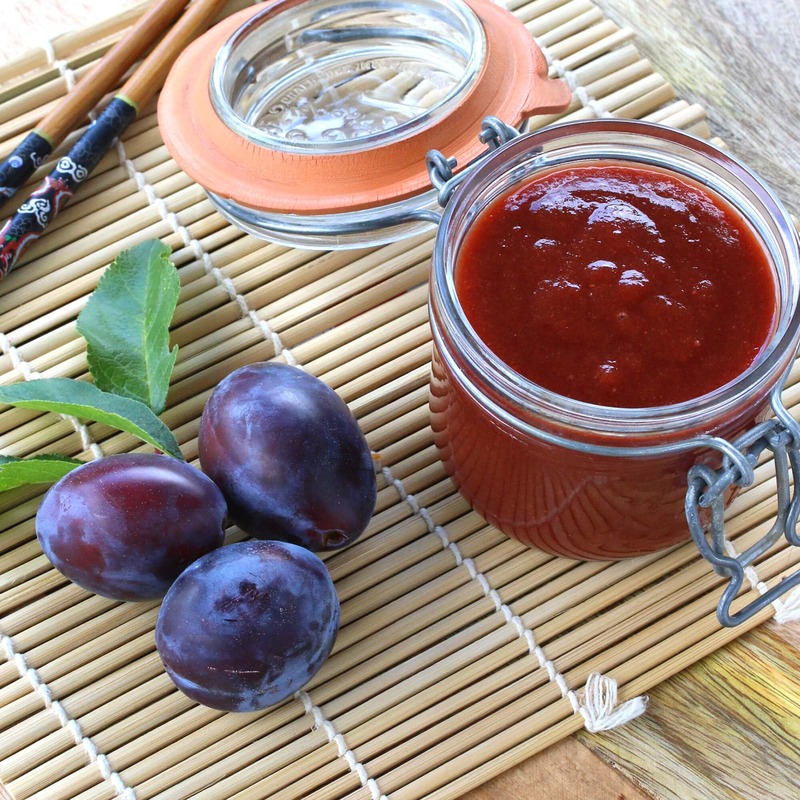 Another famous tribute to plums is a culinary one and it comes in the form of Plum Sauce. Or Duck Sauce. 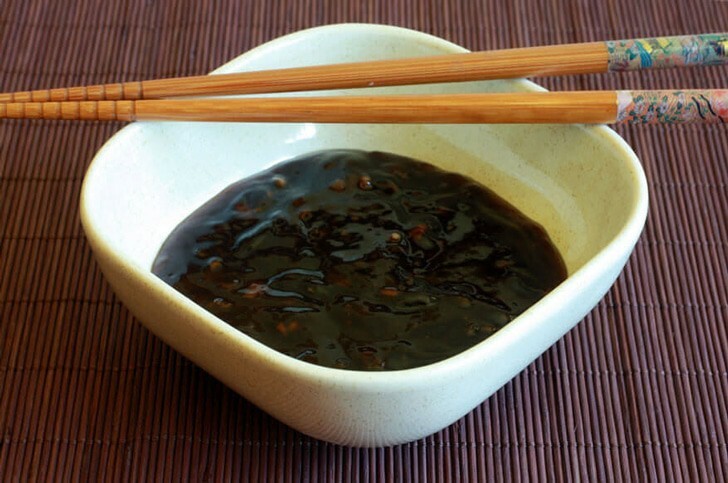 The terms are interchangeable and refer to the same thing: A highly popular, delicious, and versatile Chinese condiment you’ll find in any Chinese takeout or restaurant. And no, there’s no actual duck in it. Now I have to tell you from the get-go, this isn’t the typical congealed and anemic cornstarch + sugar + vinegar + food coloring duck sauce that comes in ketchup-style packets or in squeeze bottles at your local Chinese takeout. 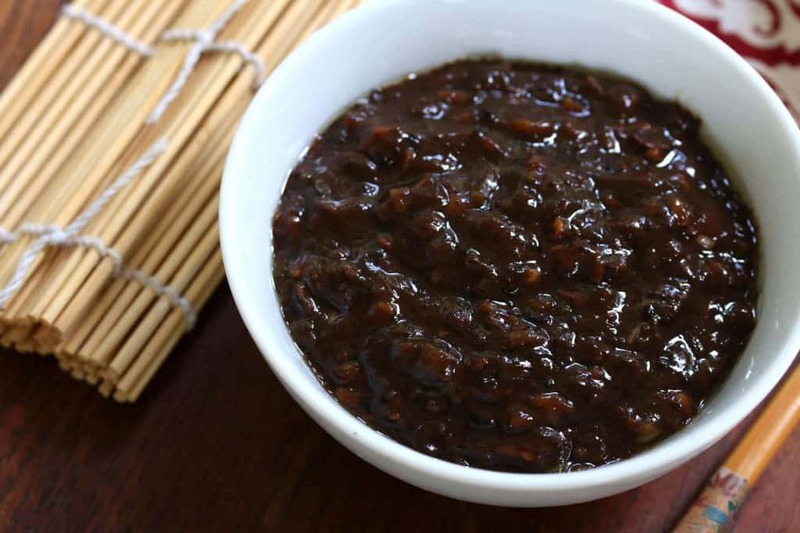 This is the more authentic, home-style Chinese plum sauce that you’ll find in only the best Chinese restaurants with a far more complex (translated “amazingly delicious”) flavor profile. Multiple layers of flavor come together to create a truly sensational sauce that will dazzle your taste buds! You can use any plums you have available for this sauce. Some variations of this sauce are even made with peaches, apricots or pineapple. You can also use traditional Chinese salted plums that come dried or in jars packed in brine. You can find them online or in Asian grocery stores but given their source and list of ingredients I do not recommend them. I am using and recommend fresh plums. 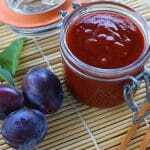 We happen to have three Italian plum trees on our property and making and canning enough plum sauce to last until the following plum harvest is one way I put our plums to good use. Plum lovers, be sure to also check out my Plum Butter, Zwetschgenkuchen (German Plum Cake), and Homemade Fruit Leather! Among a variety of Chinese spices, we’re also using another ingredient that the Chinese traditionally included in their plum sauce – sweet potato – that contributes a rich color and smooth texture. Once you’ve gathered the spices and ingredients you need, this sauce is easy to prepare and makes to either give away as a hostess gift or to last you for quite a while. 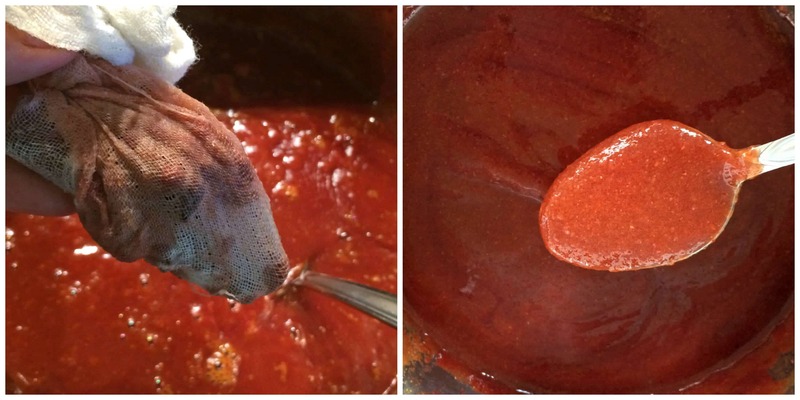 This sauce can be made and eaten within a couple of weeks or canned for long-term storage. I’m including canning instructions for those interested. What Do You Eat With Plum/Duck Sauce? Use it as a dipping sauce for everything from wontons, egg rolls, spring rolls, dumplings, roasted duck (where it got its nickname “duck sauce”), fish, chicken, shrimp, or with noodles and rice. Use it to baste your meats before grilling. Use it as a glaze for baked poultry and pork. You’ll love how versatile this sauce is. AND DON’T FORGET TO TRY THESE OTHER GREAT ASIAN SAUCES! Place all the ingredients except for the spice mixture in a medium-sized pot and bring to a boil. Reduce the heat to medium-low and simmer uncovered for 30 minutes. Use an immersion blender or transfer to a blender to puree until smooth (then return to pot). Place the whole spices (skip if using store-bought five spice powder) in a small dry pan and toast over medium-high heat just until fragrant. Be careful not to scorch the spices or they will taste bitter. Let the spices cool and then place the whole spices in a piece of cheesecloth tied shut with string or in a tea sachet. Do the same if using store-bought ground five spice powder. Place the spice packet in the pot with the plum sauce and continue to simmer uncovered for 25-45 minutes until the sauce is thickened to the desired consistency. Discard the spice packet. Let the sauce cool. Store in the fridge in an airtight non-reactive container. Will keep for up to 2 weeks. 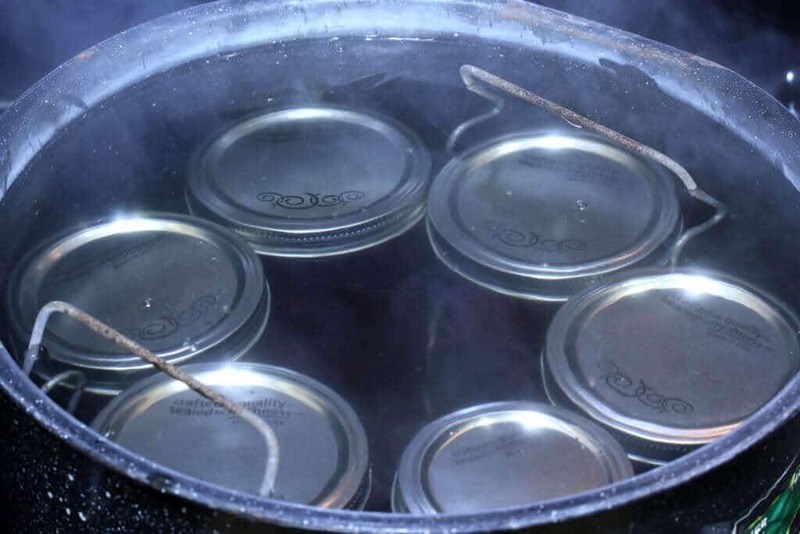 OPTIONAL CANNING INSTRUCTIONS: Ladle the hot plum sauce into sterilized jars, seal with the lids and process in a boiling water canner for 15 minutes. Turn off the heat and let sit for 5 minutes. Remove the jars and let sit undisturbed for 24 hours then check the seals. Will keep in a dark, cool place for at least a year. 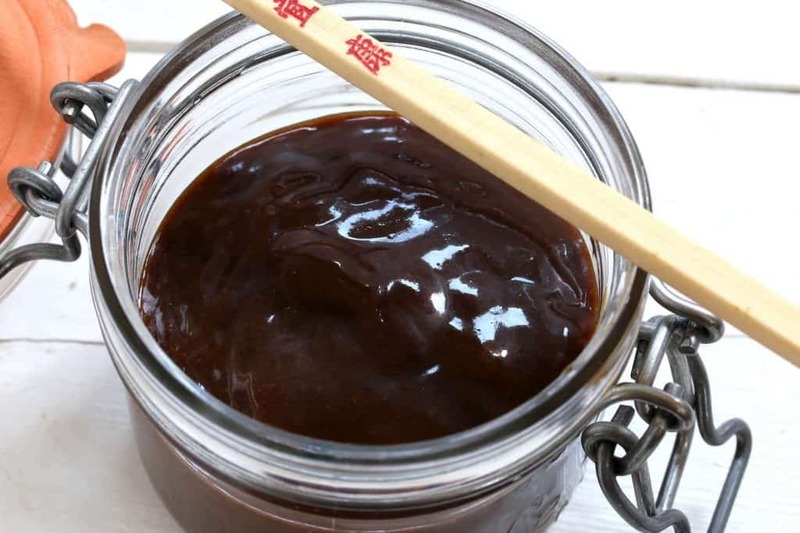 Use this popular and versatile Chinese condiment as a dipping sauce for for everything from wontons, egg rolls, spring rolls, dumplings, roasted duck, fish, chicken, shrimp, or with noodles and rice. Use it to baste your meats before grilling or as a glaze for baked poultry and pork. CANNING INSTRUCTIONS: Ladle the hot plum sauce into sterilized jars, seal with the lids and process in a boiling water canner for 15 minutes. Turn off the heat and let sit for 5 minutes. Remove the jars and let sit undisturbed for 24 hours then check the seals. Will keep in a dark, cool place for at least a year. Hey Kimberly…! 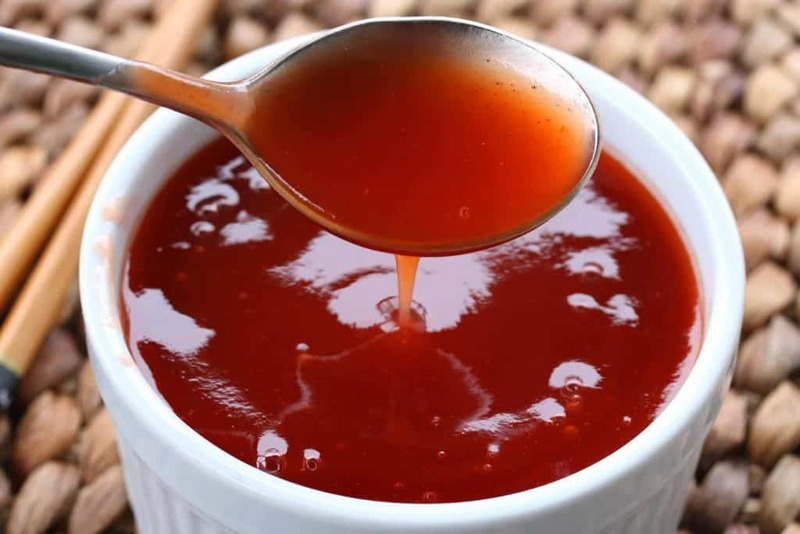 your duck sauce recipe is very simple with healthy and your sauce looks amazing or delicious. 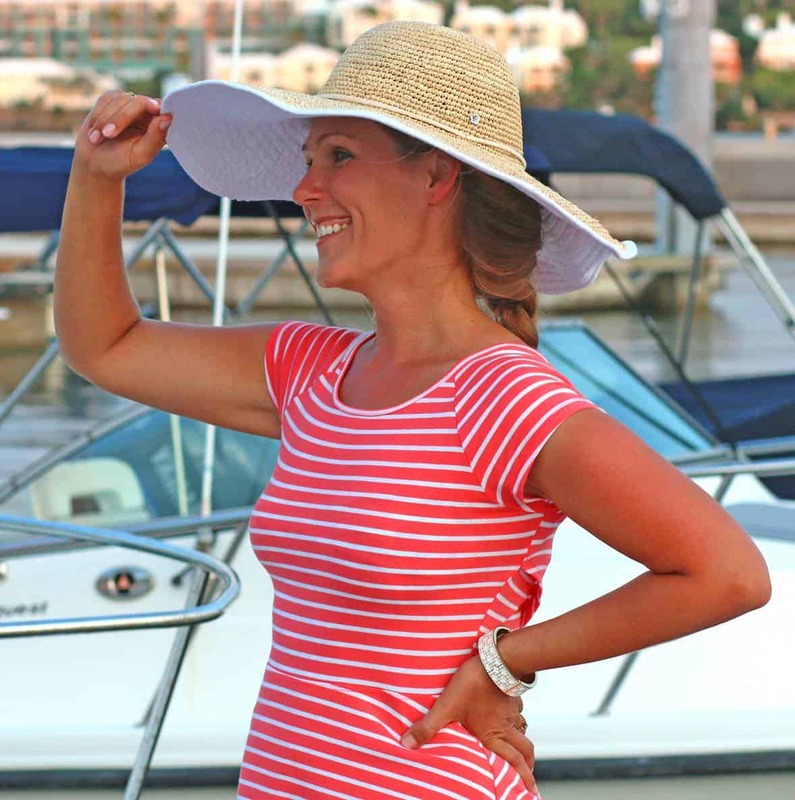 thanks for the sharing and keep shared your new recipe and ideas…! One of my friends asked me if I had a plum sauce recipe and I did not! I will share your scrumptious version with her!!! Is it sad to say I have never tried authentic duck sauce?? The chinese “ketchup packet” always made me steer clear but this sounds amazing and would love to try this version soon! Ohhhh this is my favorite sauce ever!!!! 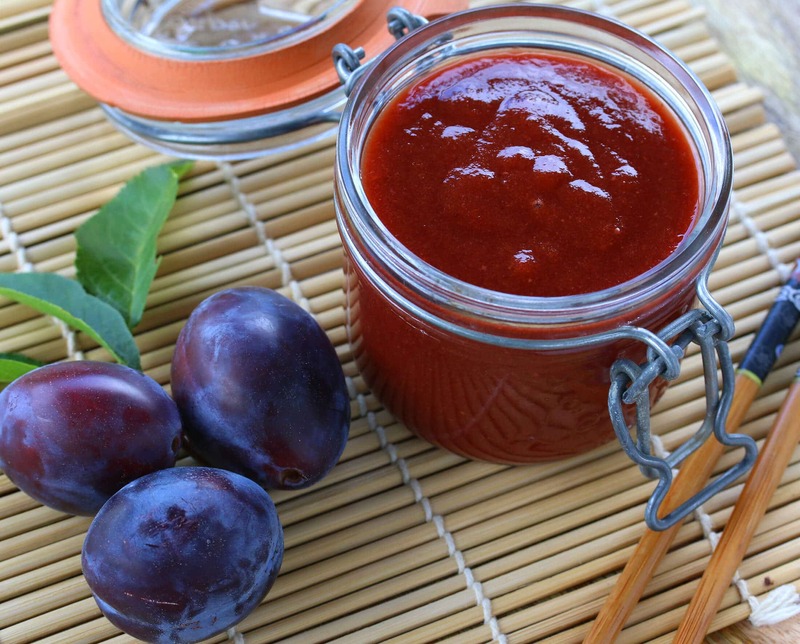 Those plums are gorgeous and that sauce is to die for! Perfection! I would love to have 3 plum trees…heck, I would love to have 1 plum tree haha! This sauce looks so good! I can’t wait to try this! It would be so great to have on hand. Such a great idea to make your own! I’m not a fan of those little packets at all — this is so much better! When I was growing up, plum sauce used to be served with chicken fingers. Of course, this was in Canada. We used to eat it all the time! Everything is better homemade! This looks delish! Hey Kimberly….! this is one of my favorite recipe and your duck sauce looks so yummy and delicious i will make it….thanks for the sharing…..! 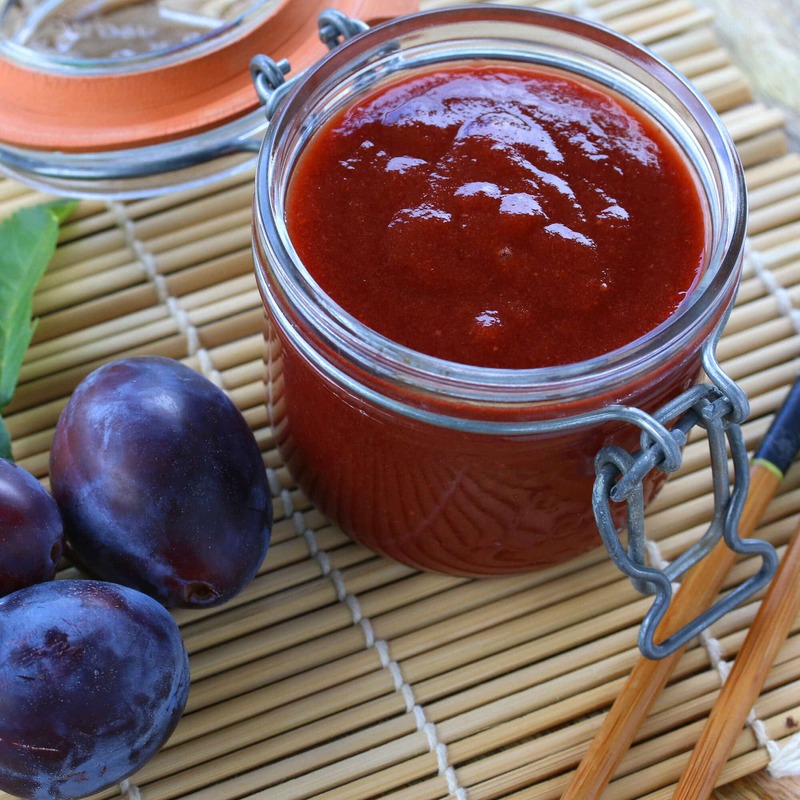 I have never had plum sauce, but I would love to make it. Normally we have kilos and kilos of Zwetschgen this time of year, but not this autumn. Like in the case of cherries, there is not one plum in the tree… Really a bad year for fruit in our region. I will have to remember this sauce next autumn. 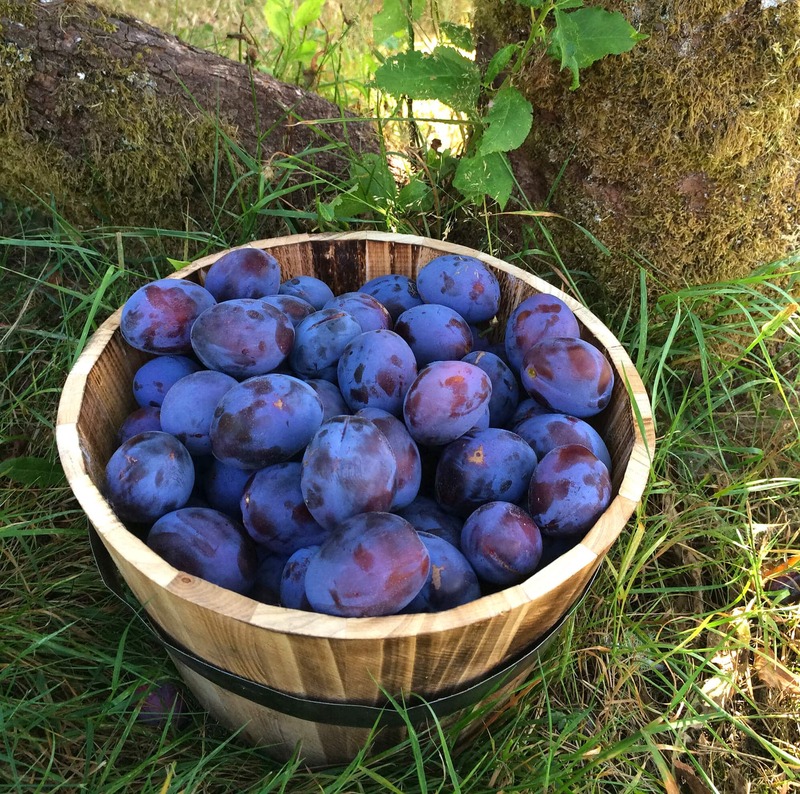 It’s funny you mention that, Adina, this year has been absolutely terrible for us too – our plum tree has maybe 1/4 of the plums on it this year compared to last year and some of our other fruit trees have the same problem. It’s so strange. I’m crossing my fingers next year is much better! One of my favorite sauces on the planet. This is going to come in handy. WOW, the flavor is indescribable, so many things going on in this sauce and I absolutely LOVE it! Excellent recipe, the flavor is fantastic! Wonderful, Brett, thanks so much! Just finished making 40 litres of plum/chilli/ginger/garlic, looking forward to trying this for the last 10 litres of plums! 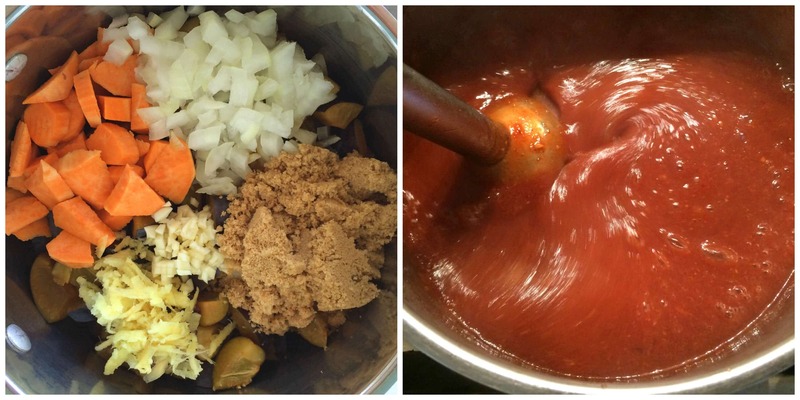 Tip – roast plums at 90^C for 3 h then cool, improves flavour and much easier for pitting when you have a lot! How much of the 2 pints is one serving? Hi Gail, I just updated the nutrition info breakdown to show by the tablespoon. There are roughly 64 tablespoons in each batch and one serving is generally 1-2 tablespoons. Just finished making this and it is outstanding. In addition to the uses you suggested, I recommend it on a cracker as an appetizer–either by itself or with a little cream cheese spread on the cracker first. Wonderful, grayslady, I’m so glad you enjoyed it and thank you for the delicious serving tip! Oh the flavor!!! Everything is balanced so well and the it tastes absolutely amazing!! Where can I get garnet yam. Are they available in supermarkets? Hi Chris, depending on where you live and the popularity of yams in your area, it’s the standard yam that most supermarkets sell with the orange flesh inside. If the supermarkets where you live don’t sell them you can also find them in many ethnic stores, particularly African grocery stores. Fantastic, Becky Ann, I’m thrilled to hear that, thank you! 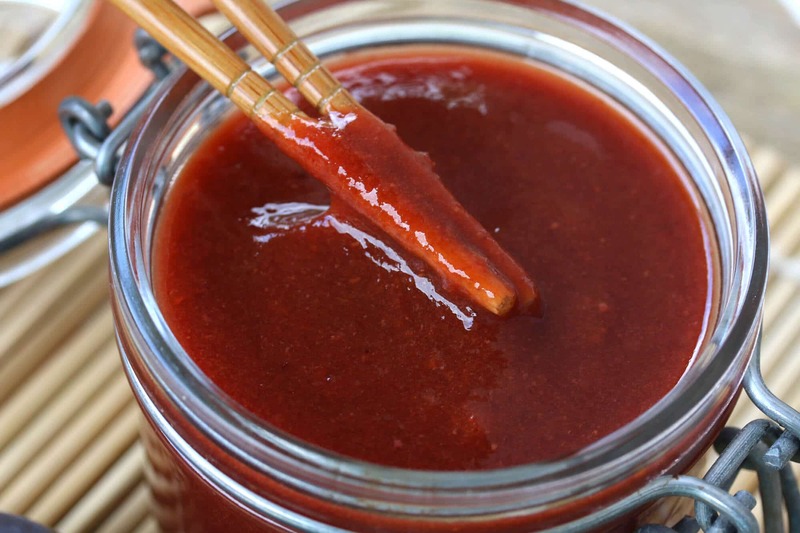 Just finished my batch of this delicious plum sauce. Thanks for the recipe. Got to use up the last of my plums before they were ruined by the wasps.Looking forward to adding this to my children’s Christmas hampers. Wonderful, Gloria, I’m so glad you enjoyed it and hope your children do as well – thank you! 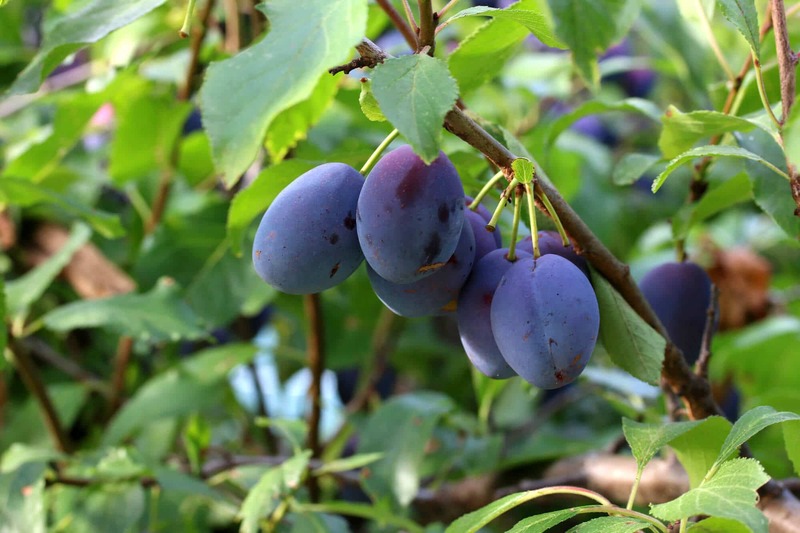 What are the best kind of plums to use? I live in NC. Hi Annie, you can use any plums you have available, they’re all equally good for this sauce. I was making plum jam and decided to puree it with my food processor. I read you are not suppose to use a processor or blender as it ruins the jam so I had half not processed. I brought it to a boil and accidentally scotched the bottom just a bit. I removed it from the pan and ran the glop through a screen to remove a few bits of scortch and all the thicker skin bits and half the mixture was lost. I have enough left of the 3 lb batch to want to save it but it tastes very bitter and full of tanin taste from the peels. I noticed you mention if the spices get scorched in your plum sauce recipe it will be bitter. DO you think scortching just a little has ruined my whole batch? I know I am not doing your recip but thought being a gourmet you may have some insight to my dilemma. Hi Karen, whether it’s ruined just depends on whether you think it’s still edible. But as far as rescuing it from the bitter taste, no, I’m afraid there isn’t much you can do about it at this point. Thanks after all that work I need confirmation that I may need to toss it. My husband was so sweet to help me pit the 3 lbs. But it is awful bitter. Thanks for the quick reply. I’m so happy to hear that, Jackie, thank you! Hi Jeanie, I haven’t tried freezing it but there’s only one way to find out! :) Also, if it’s a little tart you can always add a little sugar. I’m glad you enjoyed the sauce, thank you for the feedback! OR 1 teaspoon Chinese Five Spice Powder” This does not reference the other spices in any manner does it? IT is just that the last two colored bullets are blue. Specifically is it ONLY Fennel or 5 spice. Hi Dan, I can see how that’s confusing. The “or the 1 teaspoon Chinese Five Spice” is instead of the “Spice Mixture”. So the Chinese Five Spice can be substituted in place of the list of spices under the “For The Spice Mixture” section of the list of ingredients. I hope that provides better clarification. Hi Carol, correct, they get processed with the blender. They blend up perfectly and the result is a very smooth sauce.